The back-to-back episodes that I think have the best quotes are "Arthur vs. the Piano" and "The Big Blow-Up." "Arthur vs. the Piano": I like the conversation between Ms. Krasney and Binky about "ear-painting," when D.W. said to Grandma Thora, "Grandma, you're so smart. Now my head won't pop off! ", and when Buster said, "That's it! Next time I'm playing 'Jingle Bells!" (at a spring recital). 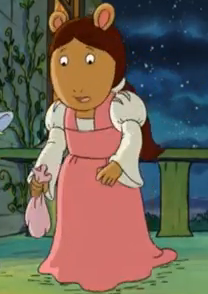 "The Big Blow-Up": Some of the greatest quotes were when D.W. asked Arthur to help her with her letter to Santa. "In May?" (another Christmas in spring joke) "Do you know how many letters he gets in December? I want to beat the rush!" And then, "Dear Santa, Is it tough being the world's most handsome man?" (It is if you're Tim Allen!) Oh, and as for the quotes associated with Francine and Brain's fight, I liked it when Francine said to Brain, "Go fish, yourself!" D.W. and Brain parallel: D.W. says, "No way!" in "Arthur vs. the Piano," and Brain says, "No way!" in "The Big Blow-Up."